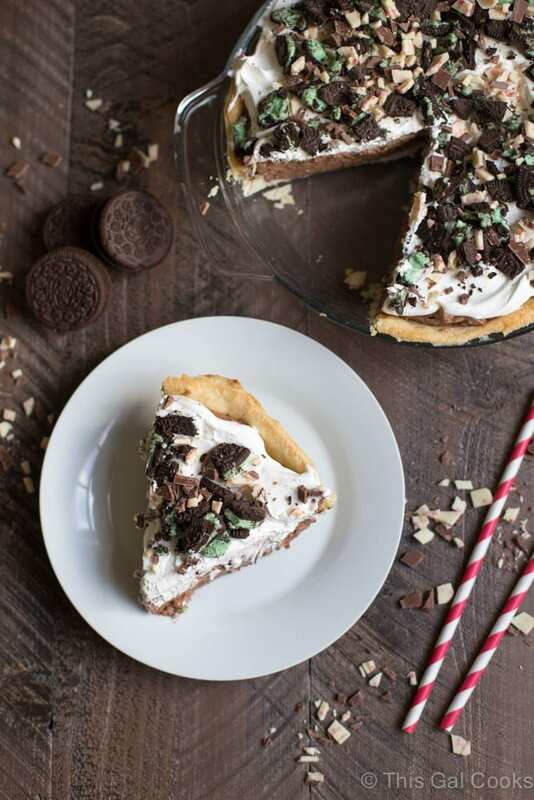 You guys, this mint chocolate pudding pie is outta this world amazing. Ken and I devoured it in two days. Two days for two people to devour 8 slices of pie – is that insane or what? At least we didn’t eat the entire pie in one sitting. 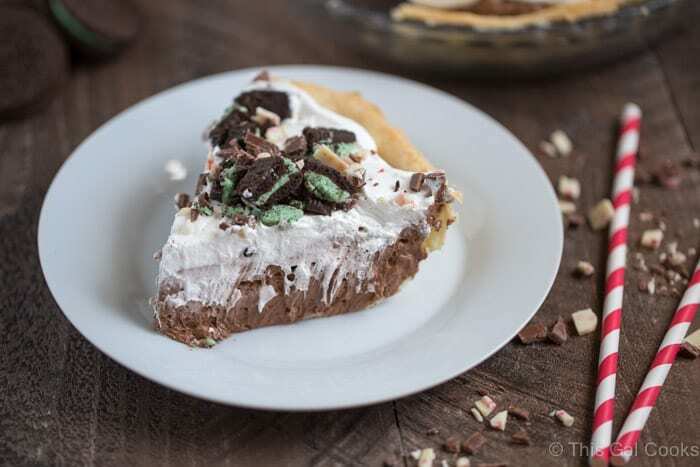 This creamy, minty, chocolaty pie offers everything you’d expect from a Christmas pudding pie. Silky, smooth, easy to make and bursting with flavors that everyone loves. After I ate a slice, I wanted to eat more. You probably will too because it’s that darn good. 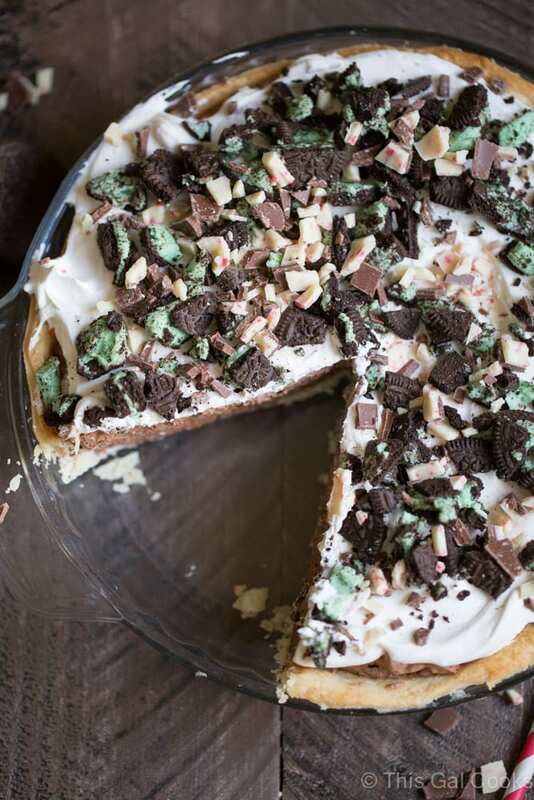 I hope you enjoy this mint chocolate pudding pie as much as Ken and I do. 1 9 inch pie crust, prepared according to package directions for unbaked pies. (must be baked and then cooled before use). Whisk together the milk and instant pudding mix. Mix in half of the Cool Whip and then mix in 1 C of the chopped Oreo cookies. Pour into the prepared pie crust and spread out with a spatula. Refrigerate 20-30 minutes or until firm. Spread the remaining Cool Whip on top of the pie. Sprinkle with the remaining chopped Oreo cookies and the chopped peppermint bark. I love the combo of mint and chocolate Julie! Looks refreshing! I can certainly understand why you devoured this pie! The mint and chocolate together is always delicious! That looks awesome and I think I might have everything in house to make it this week! Thanks for sharing at Snickerdoodle Create-Bake-Make! I love mint and who can resist chocolate? I can’t wait to try this pie. Thank you for sharing on Mad in Crafts Link Party. Hashtag love this! It sounds amazing so I HAVE to PIN it. Thanks for sharing this at the DI & DI link party. Merry Christmas! 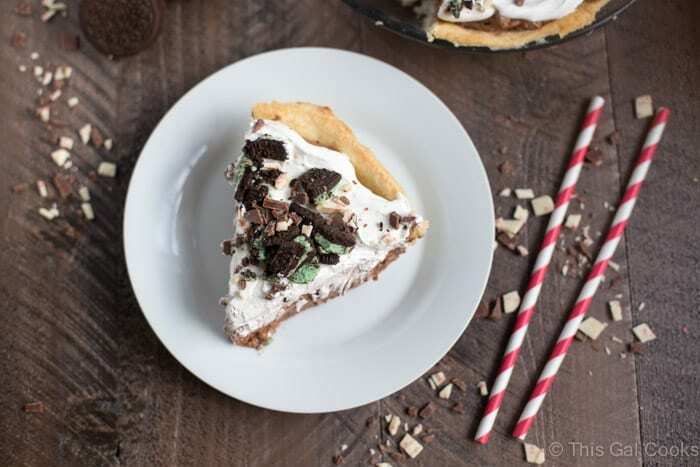 Oh my goodness your Mint Chocolate Pudding Pie looks fantastic! Thanks so much for sharing your awesome recipe with us at Full Plate Thursday! Hope you are having a wonderful week and hope to see you soon! Pingback: Creativity Unleashed No. 152 - And A Ryobi Giveaway! I love chocolate, and It’s cake, Looking at the picture make me hungry. I will definitely try making it tomorrow, hope it turns out well. Is it still ok if you put it on the freezer to enjoy for the next day? THIS right here would be a part of my LAST MEAL! HOLY MOLY! You’re welcome, Anna! I hope you enjoy the recipe! This looks amazing!! Most definitely will be trying.